Last week I received my copy of Houdini, Mago dell'impossibile by Massimo Polidoro. This certainly appears to be a serious Houdini biography, and I hope one day it will be published in English. But even in Italian I was able to learn something new. Among the book's several unpublished photos are two on page 107 from the collection of Ken Trombly that made me whoop. The reason being these show a stunt that was thought to have never happened! In 2011, San Diego Union-Tribune columnist Richard W. Crawford published The Way We Were in San Diego. In his book Richard shared hitherto unknown details about Houdini's only performance in the city in 1907. He also found a newspaper advert saying that Houdini would dive handcuffed from Spreckle's wharf into San Diego Bay. But he could find no evidence that the stunt ever happened and concluded that it had not "for reasons unknown." 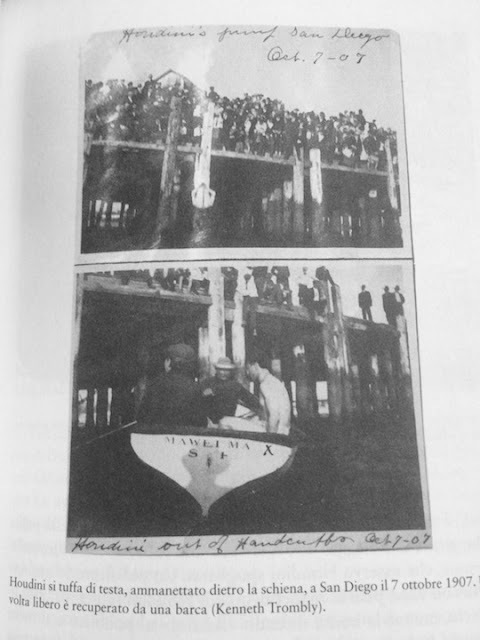 But now these photos show that it did happen, and they even provide us with a date, October 7, the same day Houdini opened at San Diego's The Grand Theater on Fifth Street. So we have some revised Houdini history here. Love it when that happens! You can purchase Houdini, Mago dell'impossibile at Amazon.it and Amazon.co.uk. This San Diego dive will no doubt go into the Chronology. Thanks terrific new information. Thanks for sharing this latest discovery. Wow! I don't doubt the photo but I'm puzzled by the lack local newspaper interest in the jump. Great scoop!